Today many investors faced the problem of choosing investment option, which would provide for stable profit and have a low risk. Some time ago bonds and other fixed-income instruments with low return, as well as shares of “blue-chip” corporations were such type of investments. The feasible solution in current situation is commercial real estate investment, which generates a continuous cash-flow from rental payments, offers the intrinsic security and inflation protection of real estate and additionally provides an opportunity for long-term capital gains. Today many investors faced the problem of choosing investment option, which would provide for stable profit and have a low risk. Some time ago bonds and other fixed-income instruments with low return, as well as shares of “blue-chip” corporations were such type of investments. However, today many investment-grade bonds demonstrate very low and sometimes even negative interest rates. Shares of so called “blue chips” are investments with high level of risk, and in today’s volatile environment they can bring serious losses to their owners. Even gold and Japanese yen have not performed very well as safe-havens recently. The feasible solution in current situation is commercial real estate investment. Commercial real estate, like fixed-income instruments, generates a continuous cash-flow from rental payments, offers the intrinsic security and inflation protection of real estate and additionally provides an opportunity for long-term capital gains given wise choice of object and overall risk assessment. Investment-grade real estate will not lose significant part of initial value as in case of corporate shares during economic downturn. The diagram below clearly shows advantages of investments into Swiss real estate (green line) compared with other investments (Swiss equity market: blue line; Swiss government bonds: red line) during 2000-2011. Please, note that in case of real estate there is no reaction to financial crisis in 2008-2009! Here and below we provided diagrams based on data until 2011, since major turmoil in global economy happened in this period, and markets showed interesting volatility. Later we will issue article demonstrating market behavoir during 2006-2018 for comparison. Diagram: Swiss market relative performance. Experts recommend paying attention to investment in touristic real estate. It is obvious today that tourism industry is one of the long-term factors for development of global economy. Growth in tourist sectors has exceeded world economy growth six years in a row, demonstrating stability of industry to global geopolitical uncertainty and economic volatility. According to the report “World Travel Trends” (ITB Berlin, January 2018), the main tendency of tourism in 2017 was strong growth of world outbound travel despite of natural disasters and terror attacks, shift to “safe” destinations and controversial protests against “overtourism” in various destinations. Global growth of international travels in 8 months of 2017 was above average at 6% first time since 2010. Total number of international travelers in different destinations was 901 million from January to August of 2017. It is 56 million higher than during the same period of 2016. Leaders among destinations are North America (+7,5%) and Europe (+5,5%). According to forecast, growth will be 5% in 2018. The main reason for travels last year was holidays. One of reasons for fast and strong development of tourism is that people in industrial and developing countries, such as Southeastern Asia, India and South America, have now significantly longer lifetime, which allows them to travel during retirement. Besides, significant increase in personal incomes for developing countries’ citizens, especially, in Far East (China, Korea, Japan) opens world tourism opportunities for billions of new travelers. And, finally, since the nature of job has been changing, people in developed countries will have more free time that gives them more possibilities for holidays and travels. Europe is undoubtedly No. 1 tourist destination in the world. For many years Europe demonstrates strong tourist number growth, offering warm welcome to the people from different places on the globe. Even Europeans preferred travelling on short distances within Europe last year. Number of such travels grew in 2017 by 6%, while number of international tourists that reached their dream to visit European countries grew by impressive 8%. Besides, Europe returned love of Asian tourists (+7%) representing attractive segment of travelers that will support future development of world tourism. 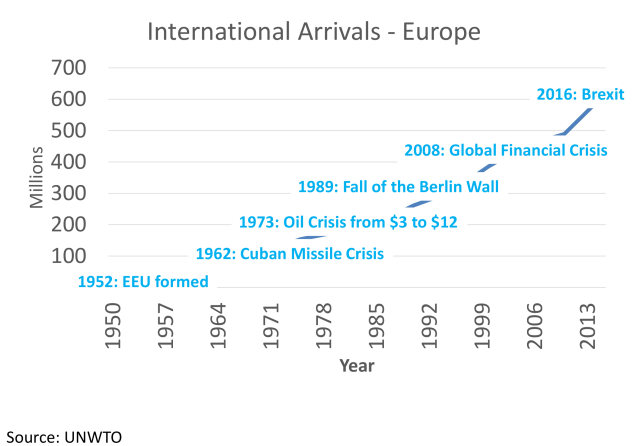 Diagram below shows tendency in growing number of foreign guests arriving to Europe. As you can see, this tendency was not interrupted neither by oil crisis in 1973, nor by fall of the Berlin Wall in 1989, nor by global financial crisis that hurt world economy in 2008. Diagram: Number of foreign guests arriving to Europe, million people. One more important tendency in modern tourism is serious change in the sector of exclusive travels. Today wealthy tourists are looking not for luxury hotels, but for “unique and personal experience”. This is why companies working in luxury sector now have to offer not a product, but immersive and exclusive experience. Report “Shaping the future of luxury travel” (by Amadeus, 2016) notes that people today invest more of its real income not into material values, but into unforgettable experience, which can be given only through exclusive travel. In order to satisfy demanding clients, players of luxury segment offer new so called “non-googleable options”. These are travel opportunities that are not affordable for wider segment of tourists, including impressive landscapes, authentic atmosphere, exclusive tickets to cultural events, etc. During 2011-2015 growth of exclusive travels was higher than for travels in general. According to data from World Travel Monitor, luxury travels represent only 7% of all international trips, but their share in global travel expenses is about 20%. It shall be noted that rich travelers spend six times more than ordinary tourists. They usually make 5-6 trips per year compared with 3 trips for other travelers, US International Luxury Hotels Association says. Expenses of rich tourists are resistant to economic fluctuations and downturns. Decision about trips depends neither from current income, nor from long-term family wealth. Forecast for luxury travel growth in next 10 years is 6,2%, which is almost one third higher that for tourist sector as a whole (4,8%). North America and Western Europe represent 64% in luxury travel sector. In future ultra-rich travelers from Asia will be a growing segment of the market. 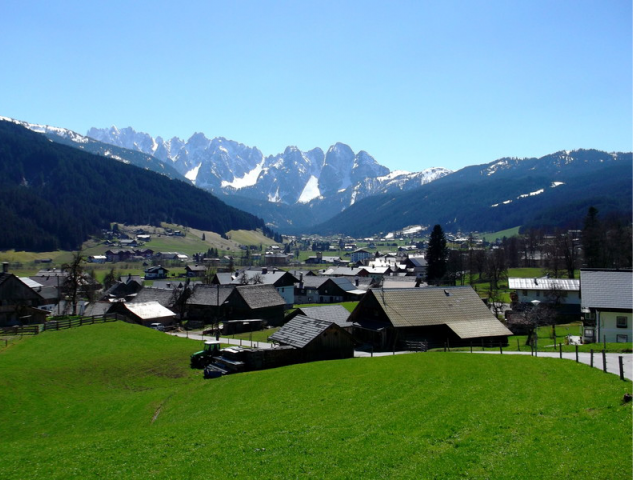 In this situation the priority option for commercial touristic real estate investments might be luxury property in skiing regions of Austria and Switzerland. As it can be seen from the diagram below, occupancy level for luxury 5***** hotels 1,4 times higher than for economy class rooms with 3*** and almost 2 times higher that occupancy level for budget class with 1*/2**. 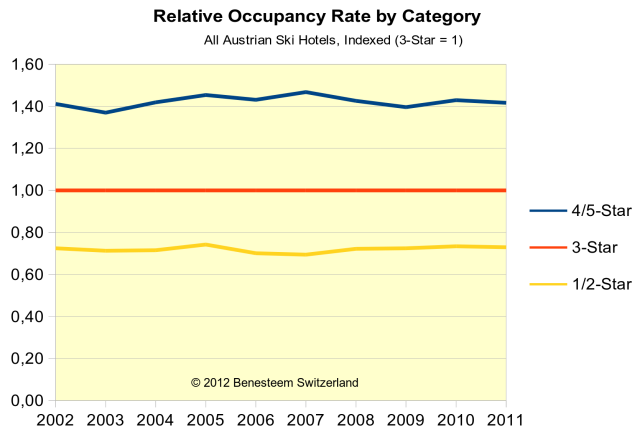 Diagram: Relative occupancy level of Austrian hotels by category (3***=1). Another diagram shows that number of beds in luxury sector is growing over time, even despite of 2008-2009 crisis. 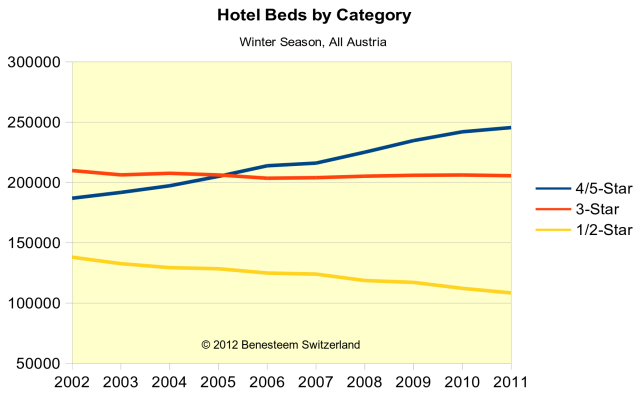 Diagram: Number of beds by category for Austrian winter season. Top locations are usually less sensitive to weather conditions due to its comfort and convenience, which is among others may include wellness, SPA, health treatments, Gourmet kitchen, and do not allow guests feeling bored even during bad weather. One of the main advantages is that real estate located at best places usually reaches higher capital value and can be easier sold than second-class or lower property. We have to note that talking about top location we mean center of Kitzbuhel or Sankt Moritz. As we mentioned above with the reference to experts in tourist sector, meaning of exclusivity has been seriously changed. When we talk about exclusivity in regards to skiing region, we mean creating authentic and cozy atmosphere, possibly with some historical details, but certainly with all modern accommodations; skiing slopes or center of village is within walking distance, but place for living is in quiet and natural place; feeling like in a mountain house, but with royal design; with possibilities for cultural and social activities (interesting sightseeing, shopping, festivals, etc.). Finally, only countries with low level of geopolitical, economic and other risks are suitable for investments into real estate. It will be hard to transfer hotel or chalet from politically unstable Italy or Spain in case of turmoil. In this situation Austria and Switzerland stand out from other touristic countries. Both countries represent stable and developed markets with high potential for continuous growth (both in tourism ad real estate sectors). They have high-end infrastructure with world crossroad in the heart of Europe. Switzerland as well as Austria have stable political situation, favorable social climate, safe and reliable legal and financial systems. It is very important that tourism is a significant component of national economy. In Switzerland it accounts for 6% of GDP, while in Austria 7,9%. This is why touristic investment projects very often find support from politics and administration at federal, regional and local levels. And finally, both countries have very distinguished geographical location that benefits skiing tourism. Austrian and Swiss Alps are unique. Combination of spectacular nature, wellness, sport, way of life, safety and proximity to cultural and business metropolitans, such as Vienna, Salzburg, Zurich, Locarno and Geneva are impossible to copy. Besides, Alpine winter tourism is a high expenses segment. Winter guests usually have budget that is 2-3 time higher than for summer visitors. Report “Travel & Tourism Competitiveness” (World Economic Forum, 2017) reviews 136 countries using Travel & Tourism Competitiveness Index (TTCI), which is a result of complex evaluation of a whole range of factors contributing to healthy and strong development of tourism. As a result of final evaluation, Switzerland and Austria took 10th and 12th place correspondingly. These two countries take high places in regards to safety (Switzerland 8th and Austria 14th), sanitary and hygiene (Switzerland 13th and Austria 4th), workforce and labor market (Switzerland 2nd and Austria 9th), environment (Switzerland 1st and Austria 2nd), tourism services infrastructure (Austria 1st and Switzerland 6th). So, choice for investors that want to invest money in reliable and effective way and get continuous profit seems obvious. Of course, in this case investor would need additional expertise necessary to make full evaluation of project. 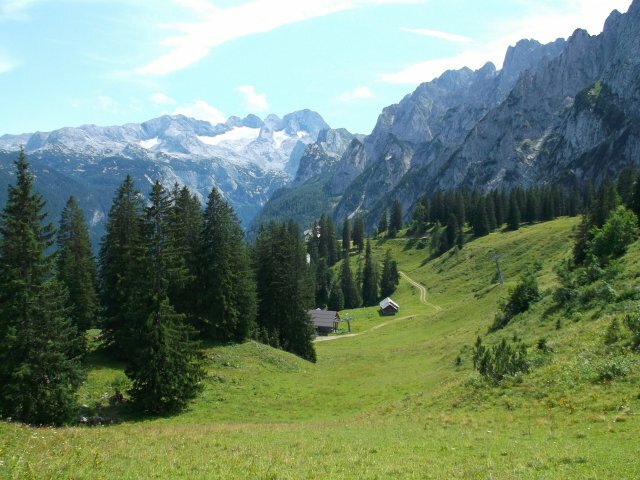 If this subject is interesting for you, then follow our articles on Glagoliza News, and we will tell you about attractive and growing Alpine region in Austria. We will also give a real example of investments into touristic real estate.